Monochord zither - Site de soundsofangkor ! 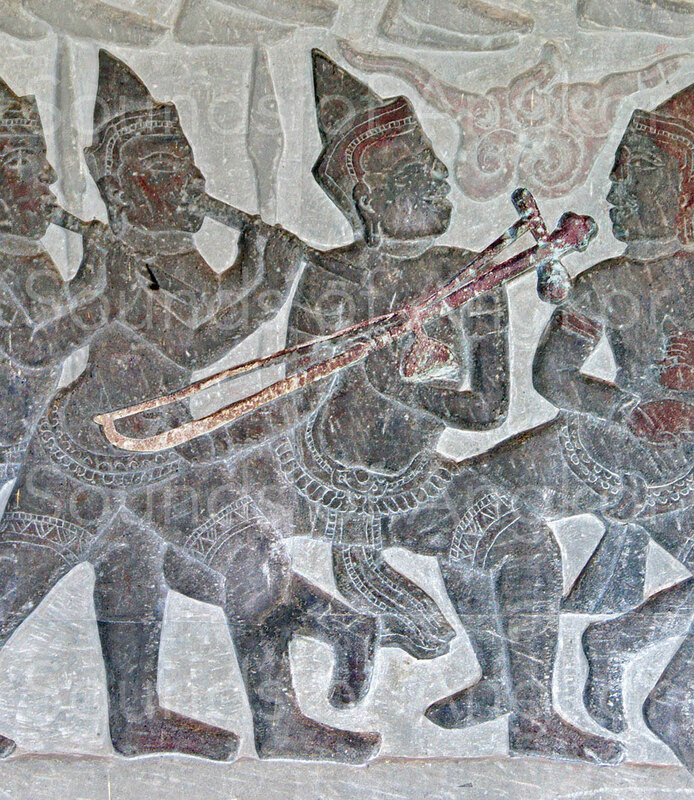 The stick zither with a single resonator is attested from the 7th century on a lintel of Sambor Prei Kuk preserved in the National Museum of Cambodia, on a high-relief of the Phnom Chisor (11th century) and on a bas-relief in the north gallery of Angkor Wat (16th century). 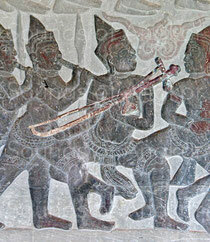 About the zither of the bas-relief of Sambor Prei Kuk (picture 1), the resonator rests on the chest of the musician. For that of the north gallery of Angkor Wat (photo 3) the sculptor had the concern to show the details of the instrument: peg and string. This is why the instrument is represented in profile. However, if we visualize the zither in its true position of playing, the resonator takes place on the chest of the musician and the angle formed by the instrument in relation to the character is conformed both to the model of the 7th century and to contemporary practices. La première cithare à simple résonateur de l’iconographie khmère. Sambor Prei Kuk, VIIe s. Musée National du Cambodge. 2. Single resonator zither. Phnom Chisor. 11th century. 3. The only representation of a zither with its string and tuning peg. According it size and shape, the resonator could be a coconut. Angkor Wat, north gallery. 16th century. The sculpture reveals anything about the material used to make the neck. It may be assumed that there were made of wood or bamboo. However, the inscription of Prasat Komphus (K.669) at the end of the 7th c. tell us that the temple received nine zithers made of a metal in copper alloy and another covered with gold. The resonators are of variable sizes. 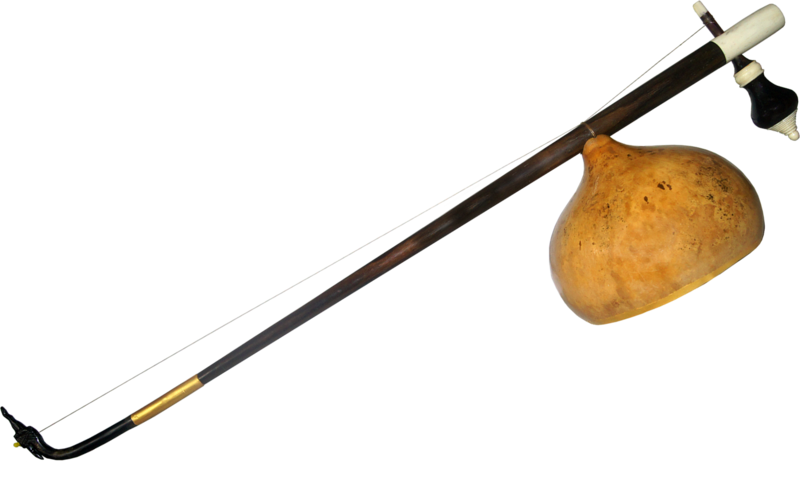 Two local materials could be used: the coconut and the calabash. The latter, of the genus Lagenaria, is a herbaceous creeping plant of the family Curcurbitaceae. Information published by French ethnomusicologist Jacques Brunet during 1960s reports that it grew naturally in the Cardamom forest. There are various forms, but it is probably the piriform fruits that composed the resonator of zithers. If one refers to current practices, the calabashes are dried, cut to size, hollowed out, sometimes decorated by etching and then attached to the neck. 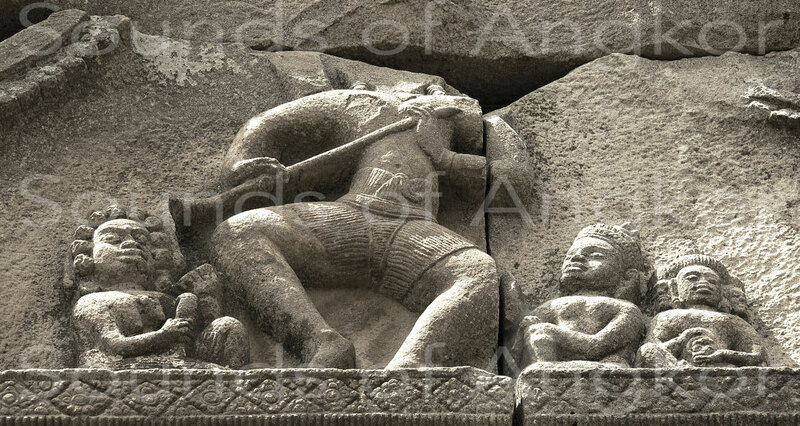 The inscription of Angkor Borei (K.557 & K 600 / 611 A.D.) mentions the term kañjaṅ. Until now, this word is an enigma for the researchers. The later inscriptions of Lolei (9th century) always have the same descriptive hierarchy concerning the temple servants (all female), namely for the chordophones: tmiṅ kinnara - zither players, tmiṅ vīṇa - harp players, tmiṅ lāv - lāv lute (?) player. 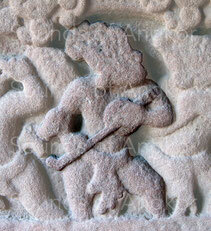 In the case of the inscription of Angkor Borei, the hierarchy is as follows: tmiṅ kañjaṅ, tmiṅ vīṇa, tmiṅ lāhv. By crossing the iconography of the 7th century (picture 1) with this inscription, it can be correctly assumed that kañjaṅ designates a monochord zither. The root of this word derives from the Sanskrit guṇa designating the string of a musical instrument. The 9th century inscriptions of Lolei temple (K.324S & N, 327S & N, 330S & N, 331S & N) mention the presence of three different tmiṅ kinnara (zither players) for each week of the lunar calendar, light and dark. Kinnara also derive from the Sanskrit word guṇa. The inscription of Prasat Komphus (K.669 / 972-973 A.D.) teaches us that the temple received ten kinnara zithers, one of which was covered with gold. The monochord stick zither with a single resonator is called ksae diev or khsae muoy that means 'one string'. 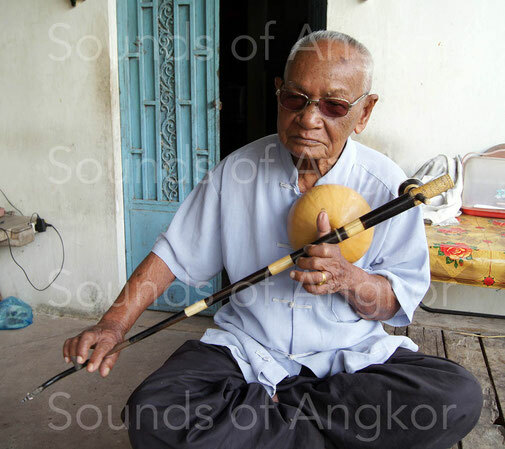 Its practice was already rarefied in the 1960s and it had almost disappeared after the Khmer Rouge revolution, period as most of the musicians were exterminated. Thanks to the tenacity of Master Sok Duch, several musicians of the younger generation can now ensure its sustainability. You can listen here one of the best of them: Sinat Nhok. A such zither with two to seven strings is also played in Thailand. It is called phin pia or phin phia.